Samsung and Nike have announced a tie in that will see the newly-announced Gear S imbued with the same powers offered only to dedicated running watches. 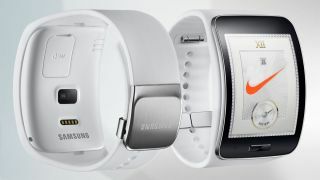 The new smartwatch from Samsung, which has a larger 2-inch curved screen than its predecessors, is able to offer full integration with the Nike+ app thanks to being one of the first smartwatches to add GPS into the mix. Other dedicated running watches, like the Garmin Forerunner range or Adidas' MiCoach SmartRun, can manage the same thing but at the cost of size. They also don't have the same connection to the smartphone, whereas the Gear S will be able to show calls, emails and texts on the go. The Nike tie-in will allow users to connect to the Nike+ community, allowing them to share runs with friends, and get real-time feedback on their speed during the run thanks to the GPS capability. This is good news for the more serious runner (or just the newbie that wants more accurate distance measurement) as current Samsung Gear 2 models use the accelerometer to measure distance through steps, and are often wildly inaccurate. Music can be streamed from the watch over a Bluetooth connection if you've chucked MP3 files onto the 4GB internal storage space. The Gear S also allows users to insert a SIM card to have on the go 3G data without a phone connection – which the Nike+ app can leverage with 'cheers' added in through friends noting you're on a run through Facebook. Whether you'd want to be 'that person' and smugly tell people you're on a run is another thing altogether. Nor will many people fork out for a separate 3G contract for their watch, so here's hoping shared contracts become a much more popular thing soon. We still don't have a price for the new Gear S, and we're hoping the GPS addition doesn't make it a chunky beast. That said, it looks like one of the most impressive smartwatches around at the moment, and fingers crossed it will make an appearance at IFA 2014.